Fort Story, also referred to as Joint Expeditionary Base East, is located in Virginia Beach, Virginia at Cape Henry. It is comprised of the former Naval Amphibious Base Little Creek and the Army Post of Fort Story. The base serves as an ideal location for Army amphibious operations training and Joint Logistics-Over-the-Shore (LOTS) training due to its proximity to the Chesapeake Bay and Atlantic Ocean. 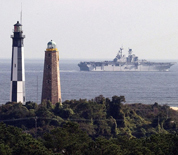 Three historical landmarks can be found on Fort Story: the Cape Henry Lighthouse, the First Landing Cross and the Admiral de Grasses statue. This Fort Story directory features the critical info you’ll need to navigate through the many facilities and recreational opportunities available on base.